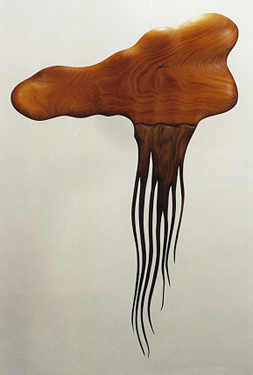 Rain, mahogany and walnut, 22" x 34"
While attending Central High in Davenport, Iowa, Jay Stratton studied art with emphasis in the three dimensional realm. On to Drake University in Des Moines, Iowa, he majored in Fine Arts, and the Studio Arts Hall quickly became his home. In the sculpture studio he experimented with many mediums including wood, bronze casting, blacksmithing, clay, silver, and gold. He graduated from Drake in 1979 with a BFA. Of his work Stratton writes, "When it comes to carving that idea into wood, I have to let the wood flow. Wood is alive, and I believe you have to be able to feel that life and move with it for the piece to work and be pleasing to the eye. Proportion, thickness of a line, contrast of another wood: all so very important in how a piece moves and attracts the eye...bringing a person in for a closer look...pulling the hand to the piece so the viewer can become intimate with the object. When the viewer gets wrapped up with a piece physically and emotionally, then I know it's right."